Daniel O’Connell was born in 1775 in Cahirciveen, County Kerry. Although he was born into the native ascendancy, he was raised among the Catholic peasantry and thus learned not only the Gaelic language, but also the many tribulations faced by the poorer class. As a teenager he was sent to France for further education but travelled to London in 1793 on foot of the French revolution. His experience of the violence that was part of the revolution forged his lifelong commitment to peaceful means to achieve social change. He qualified as a barrister and built a successful practice in Dublin. O’Connell abhorred the violence of the Wolfe Tone led 1798 rebellion but agreed with the overall aims of thr United Irishmen. In 1802 O’Connell married his cousin Mary. The marriage was a good one with 12 children being born, although only 7 survived. The 1800 Act of Union had raised hopes of Catholic emancipation but these remained unfulfilled. O’Connell soon got involved in political activities and in 1823 founded the Catholic Association with the express aim of securing emancipation. O’Connell was known a famous orator, debater and a sharp wit. He was a regular thorn in the side of the Dublin authorities and when in 1815, he called Dublin Corporation a ‘beggarly corporation’, the authorities thought they had a chance to discredit him. One member of the Corporation, D’Esterre, a noted duelist, challenged him to a duel. If O’Connell accepted the challenge then it was thought he would certainly be killed. If he backed down then he would be politically damaged and discredited. To everyone’s surprise O’Connell accepted the challenge and fatally wounded D’Esterre. O’Connell always regretted his death, and later assisted the D’Estere family financially. 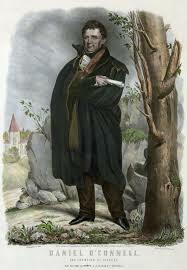 With the backing of the clergy O’Connell stood for election to the English parliament in County Clare in 1828. A massive victory for O’Connell followed as the momentum for reform gathered pace. O’Connell refused to take the Oath of Allegiance to the English crown and the crisis point had been reached. With 6 m-illion supporters backing O’Connell the English government feared an uprising was on the cards and eventually granted Catholic emancipation in 1829. O’Connell was now the undisputed hero of Ireland and a year later became the first Catholic in modern history to be take his seat at the English parliament. By this time O’Connell had given up his legal practice and was concentrating fully on politics. He set his sight on repealing the Act of Union and the establishment of an Irish parliament. His Repeal Association organised monster meetings that attracted hundreds of thousands. An estimated three-quarters of a m-illion people attended the Hill of Tara meeting. The authorities responded by banning a similar meeting scheduled for Clontarf in 1843. Despite cancelling the meeting O’Connell was arrested and charged with conspiracy. He served 3 months in prison before being released but the damage had been done. The tactics that had achieved emancipation could not be used to achieve an Irish parliament. His stay in prison had also adversely affected his health. The more radical ‘Young Irelanders’ withdrew from the Repeal Association. In the countryside the potato crop was already beginning to fail. The Great Famine of 1847 devastated the Irish countryside. O’Connell tried to help and spoke in the London parliament, appealing for aid for his desperate starving countrymen. O’Connell will always be known as the ‘Liberator’ and Catholic emancipation was indeed his greatest success. It is unknown if his peaceful mass protests could have achieved any further concessions on the road to Irish independence. The famine that resulted in over 1 million deaths from starvation and a further million taking the emigrants boat stopped any political momentum dead in its tracks. At 70 years of age O’Connell was advised to move to a warmer climate to placate his ailing health. He set off for Rome but only made it as far as Genoa. He died in May 1847 and was buried in Glasnevin cemetery in Dublin. His funeral was among the largest ever seen in Ireland.